When it comes to eye makeup I'm pretty low key. I tend to gravitate toward nudes and earthy tones. I mean, I thought the #Eyelove Eyeshadow Quad was testing my limits with those rosy hues. 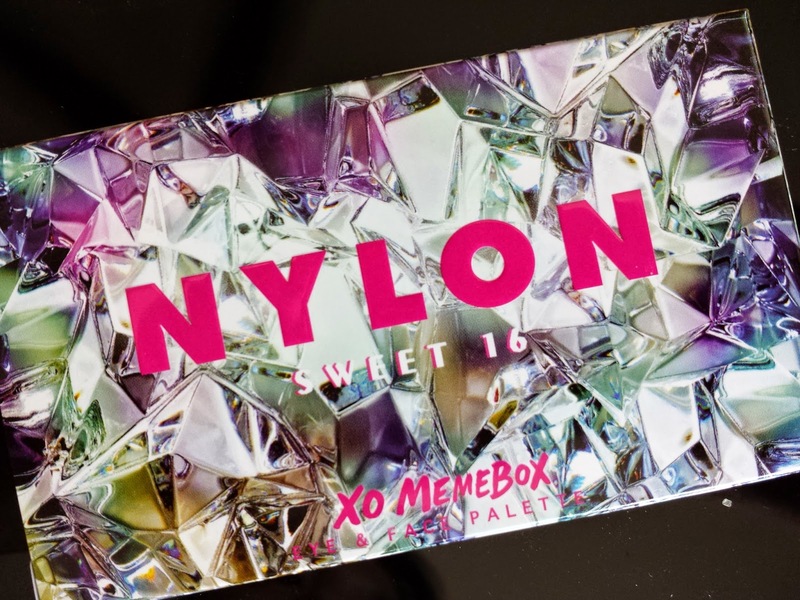 Then Memebox shoves me completely out of my comfort zone by sending me the the Sweet 16 Eye & Face Palette, a.k.a. #ItGirlPalette. 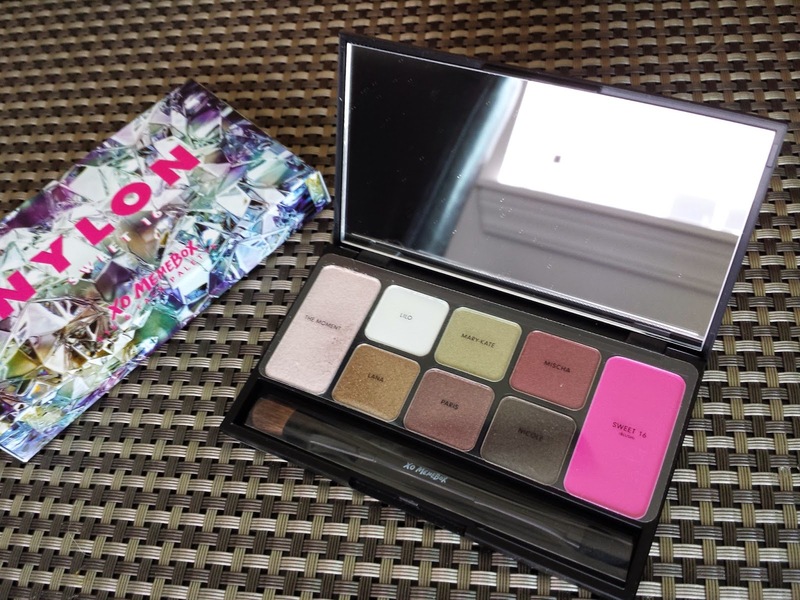 The #ItGirlPalette is a collaboration Memebox did with Nylon magazine in honor of its 16th anniversary. All the colors were chosen by Nylon's beauty editors with versatility and uniqueness in mind. The case is sturdy and a nice size, about 2 1/2"x 4", so it fits nicely in your palm. I also like that it has a huge mirror that actually lets me see my entire face. There are eight colors in this palette, and the photo below shows a close-up of them. The two on the end are a luminizer and blush, and the rest are eyeshadows. If you want to see what they look like in real life, take a look at the photos below. 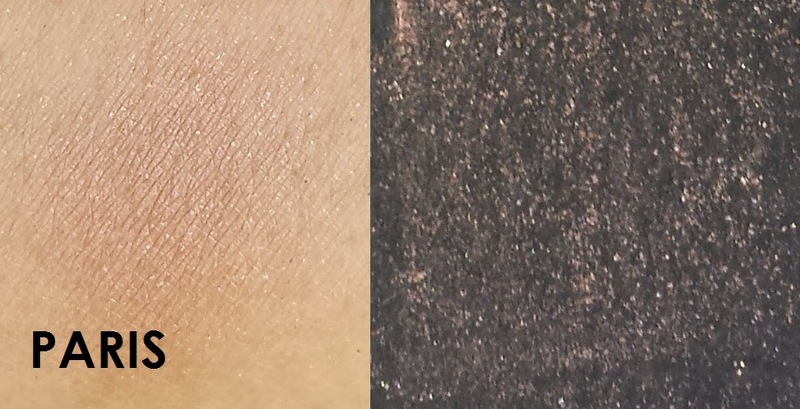 The top photo shows skin swatches in natural light; the middle photo are swatches on a black background (no flash) so that you can see the colors better, and I used flash in the bottom photo to try to bring out the shimmer in some of the colors (but failed miserably). Obviously I'm not cut out to be a photographer. Although this can be used as an eyeshadow, it was created with the intention of a highlighter or luminizer to give you a dewy glow. I've learned that I can't (don't know how to?) pull off dewy. Plus the fallout with this one can get kind of annoying. It reminds me a lot of Bae Area from the Soothing Sista #Eyelove quad. On the bright side, it's not a BAM! IN YO' FACE shimmer that will blind people when they talk to you. It's pretty subtle color-wise, but the shimmer is definitely there depending on which angle you look at it. This is such a pretty color, but I would have liked a bit more color payoff. 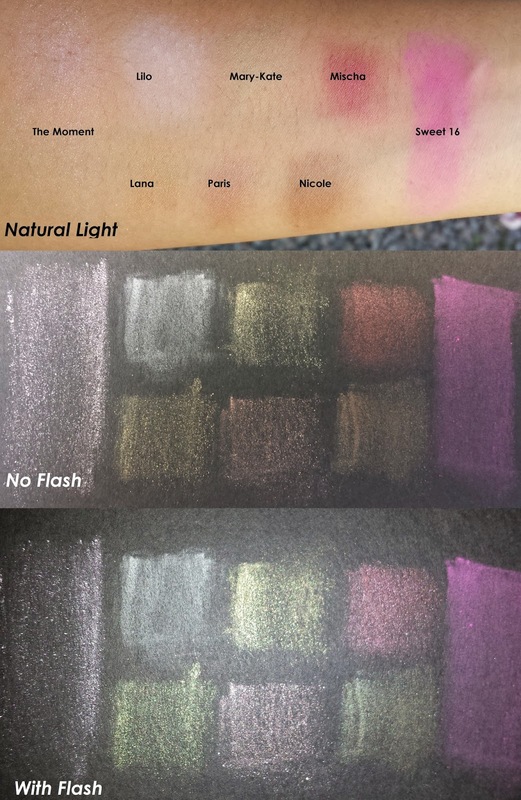 The skin swatch to the right was four swipes and you can barely see it (in fact, most of the lighter colors in this palette needed at least three swipes before I could see anything). That's probably because it's so close to my natural skin color, but I didn't find it very buildable either. I haven't tried it on my eyes yet, so hopefully that'll be a different story. I'm normally not a fan of olive hues, but Mary-Kate looks more gold than green to me so it's okay. This is another color that I had trouble getting to show up on the skin swatch. On paper it's shimmery as heck but on skin not so much. And that's a good thing. I think what I like most is that it's still wearable even for someone as boring as me. Can anybody tell me what "expensive" looks like in terms of color? Gold? Platinum? Anything shiny? (in which case this entire palette is expensive) This looks copper in the pan, but it's kind of rosy when applied to skin. I suppose that's where the "expensive" comes from: there are assholes around here who love to steal the copper wiring from streetlights and turn it around for $$$. Those idiots get rich and we end up paying more taxes to fix the lights. Expensive is right. 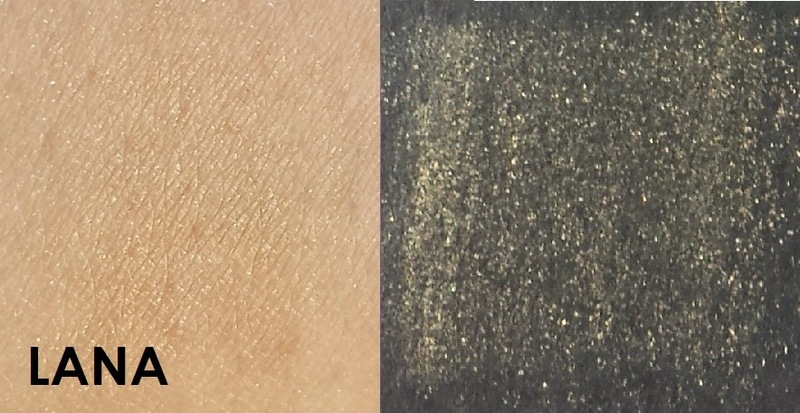 Anyway, the pigmentation isn't as great as I expected despite it looking like a pretty intense color (the skin swatch to the right is three swipes). You'd think hazel would look like a light brown, but like I mentioned earlier it looked pretty rosy to me, with a hint of brown. But I have yellow undertones so maybe that had something to do with it? When I think of grunge the words "dirty" and "unkempt" come to mind. So "grungy rust" sounds like oxidized metal times a hundred, as in the rust is rusting and forming a gross layer that threatens to slice open anyone that touches it. I think just "rust" would have been a perfectly fine description. Here we have the most pigmented eye shadow of the bunch. I was able to get intense color payoff in a single swipe. If I called the last one rosy I stand corrected. This is rosy. In the palette Mischa looks redder ("rustier") than Paris and has far greater pigmentation. 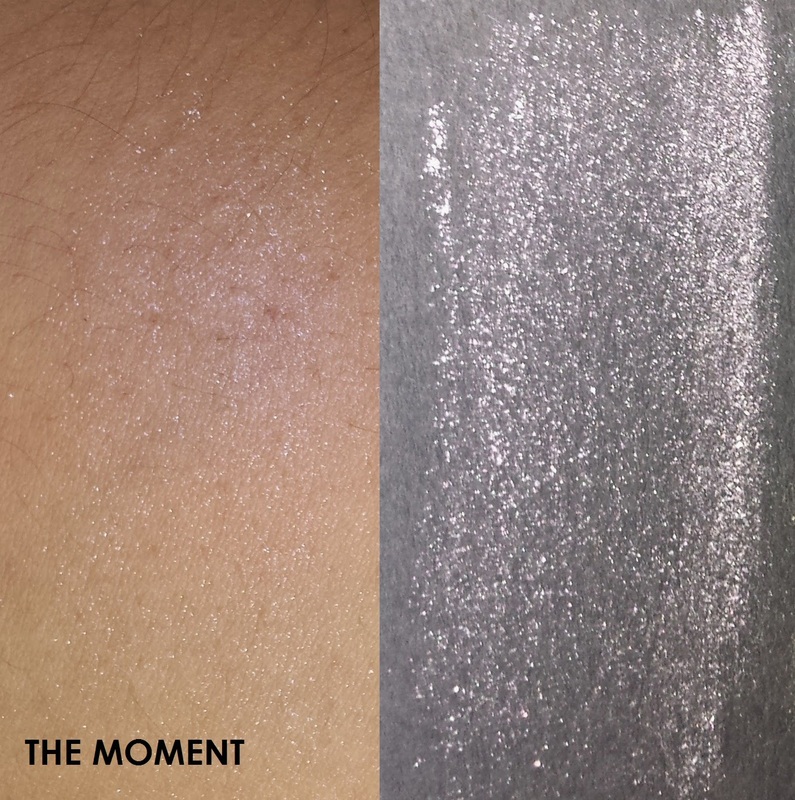 This is still a shimmer shadow, but the microglitters are finer than in the previous colors so the mess is minimal. Here we have the brainchild of the Nylon-Memebox collaboration. 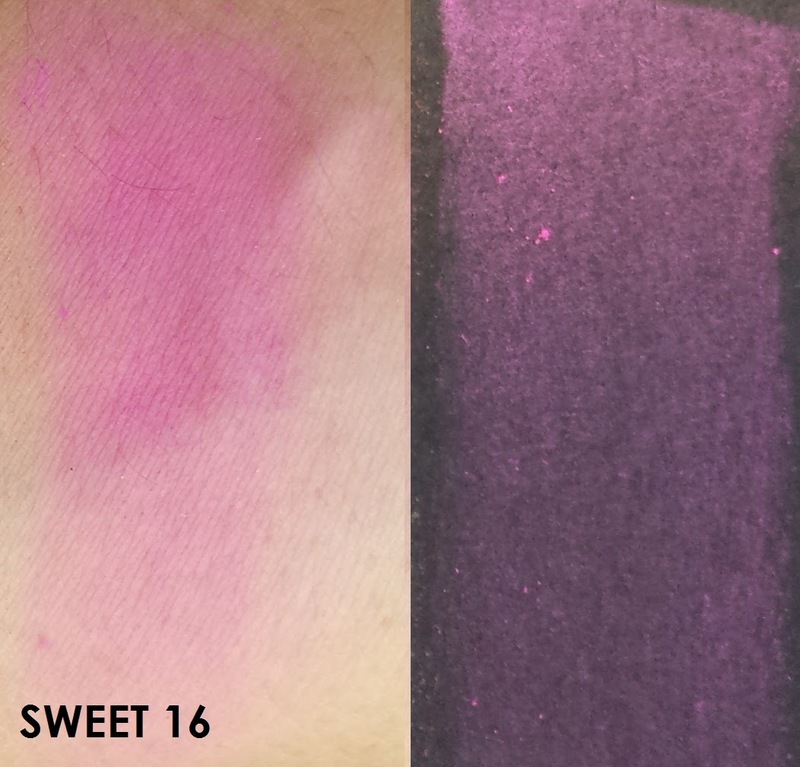 This is their signature hue for their sweet 16 celebration and I don't know why. If it's to make a fashion statement, they've succeeded as I can totally see this being used in fashion shows. If it's to appeal to the general population's tastes theeen I'm pretty sure they've failed. When I first opened the palette and saw this, images of 6-year-old me as a flower girl at my cousin's wedding immediately popped into my head. Back when my mom would put doll-pink makeup on me and call it cute and I couldn't do anything about it because I had no clue what "cute" looked like. *cry cry* This is a highly pigmented ultra hot pink color that was way too bright with just a single swipe. The makeup looks on Memebox's #ItGirlPalette page suggest that this blush can double as a hot pink eyeshadow. You know, like Jem had. Aside from the 10,000 issues I have with that suggestion to begin with, you should keep in mind that you do so at your own risk. The palette box cautions that the blush "contains a colorant that is not approved for the eye area in the US, Canada, and Brazil." I think this might be a warning that's found on most blush boxes but I've never actually read blush ingredients before (oops!) so I'm not totally sure. But in any case, that means even eyes don't like hot pink! Aside from the hot pink, I thought this was a very well put-together palette. My favorite is probably Nicole because of the duo-chrome effect. I'll probably get some use out of all the shadows at some point (weelllll, not so sure if I'm comfortable with the intensity of Mischa just yet). The Moment had a bit too much fallout for my liking, though I probably wouldn't have gotten much use out of it anyway since it's so shiny and I try to stay away from shiny highlighters. Sweet 16 will be used on Halloween when I go with an anime theme. 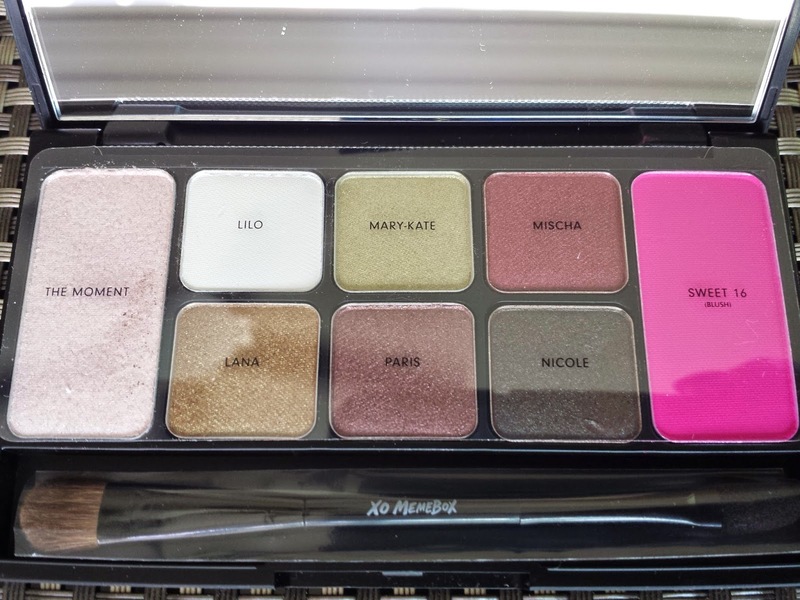 You can pick up the Sweet 16 Eye & Face palette for $29 in the Memeshop. Don't forget to use code NYLON4 to take $4 off your Nylon palette order! 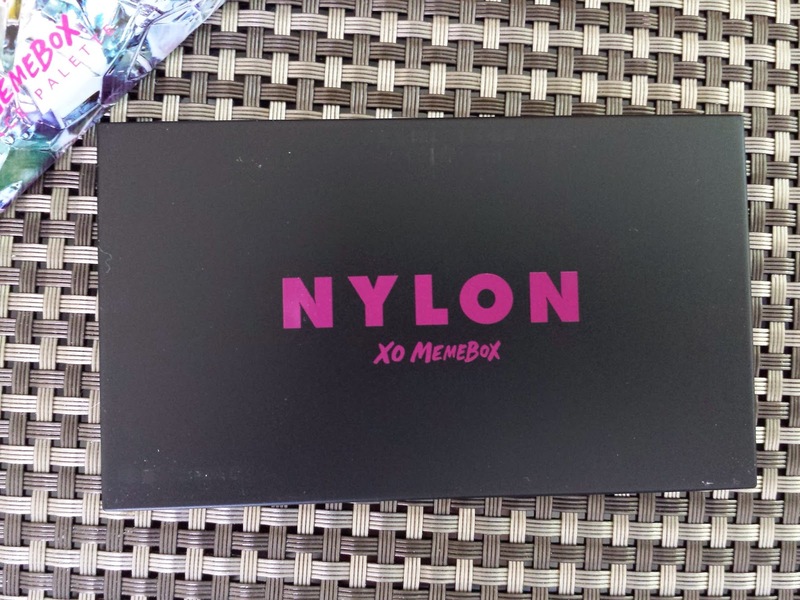 It's also available as part of the Nylon Makeup ($39) and Nylon Makeup & Skin ($49) mystery boxes. Note: Post does not contain affiliate links. 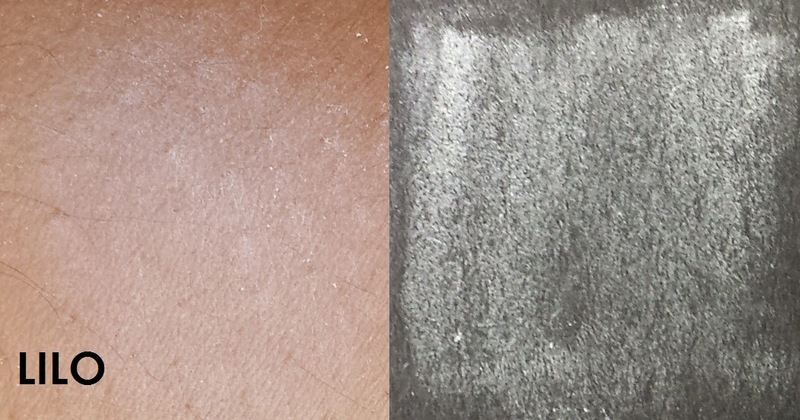 I received this eyeshadow quad from Memebox for review purposes. I did not pay for this product, but my opinions on it are 100% honest! 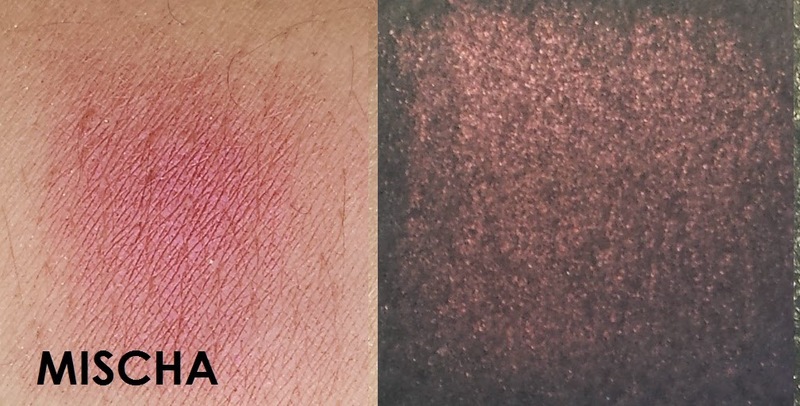 The blush warning isn't that unusual because neons (I'm assuming that's what it is) aren't approved as eye-safe by the FDA. But they are in Europe and other places, so... are your eyes feeling European and like having a sweet 16 party? Your call. Ummm, judgemental much? The MUA you posted a picture of as an example of 'all things wrong' is quite a successful MUA, who i'd imagine wouldn't be impressed having her photo used like that. You could have made your point without having to knock another woman who's doing what she loves. I apologize if I offended you or anyone else with that photo. I suppose it was rather narrow-minded of me, but that particular look just wasn't one I personally favored. I've since removed it from this post. Thank you for your feedback! P.S. Even successful makeup artists can create bad looks. I didn't see it but I'm just saying. Success does not equal perfect all the time. I think Nicole is my favorite of the bunch just because of the cool effect. The colors are decent, but I didn't find any new favorites in here. And the hot pink has got to go! My Memebox Search Soul Event Goodies! Seoul Searching With Memebox - Find the Cities!